The video endoscope with articulating end provides superior endoscopic inspection capabilities. 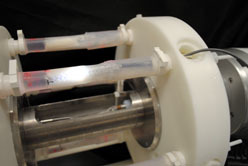 Using this device intravascular medical devices can be internally and externally inspected to determine proper sample apposition within the mock artery after deployment and prior to starting the test. 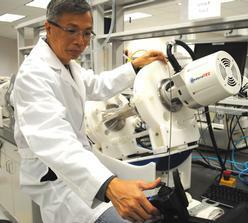 The device can also be used to inspect for cracked struts or tears during the test. 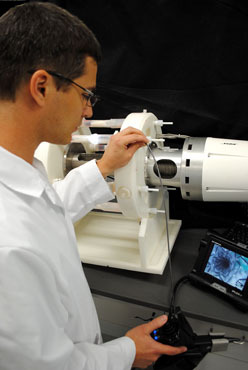 The endoscope is also ideal for inspecting axial fatigue test samples mounted on a test fixture within a saline bath. The articulating head enables inspections to be made up close and from a wide variety of angles within the bath. Both still photos and videos can be acquired with the device. The endoscope features a 640 X 480 CCD camera mounted to the end of a 4mm steerable sheath. Images can be analyzed using the ProAnalyst software to determine advanced motion and dimensional verification. This new endoscopic capability adds high resolution photos, videos and dimensional/motion verification to increase the quality of your test program.